Every barista, whether professional or amateur, must learn how to steam and froth milk. From personal experience, I can say that the learning curve includes splattering milk everywhere and even curdling it. These memorable mistakes are essential to learning how to make the velvety steamed milk and milk foam that go into caffe lattes, flat whites and caffè macchiatos, as well as make the difference between wet and dry cappuccinos. Read about best battery operated milk frother in 2017. Proteins – A little over 3% of milk is protein which can be divided into two main types, casein and whey. Casein protein makes up about 75% of the milk’s weight and its molecules gather in groups which remain suspended in the water-soluble whey protein. When we steam milk, the hot water vapor forces the casein molecules apart and then they reconnect around air bubbles. These trapped air bubbles form foam and contribute to steamed milk’s thick, creamy texture. Although we have casein proteins to thank for holding air in milk, they are to blame when milk curdles. As milk comes close to 180°F (82°C), it scalds. During this process, casein proteins lose their normal characteristics and clump together forming the curds. Fats – Whole milk includes approximately 3.5% of butterfat. This fat is composed of over four hundred different types of fatty acids that bond with glycerol to form a molecule. As the milk heats up, the bonds between fat molecules weaken and they begin moving around. These active fat molecules spread out through the milk giving it a viscous/silky feel and encompass air bubbles which creates nice firm foam. Baristas rarely use whole milk, but there’s no need to worry because 2% milk and even skim still contain enough fat molecules to provide texture and stabilize foam. Interestingly, a study done by students from the University of California, Los Angeles determined that a high fat content stabilizes milk foam better at temperatures below room temperature, while milks with a low fat content create foam that is more stable at higher temperatures for instance in hot drinks. Carbohydrates – The carbohydrates found in milk are called lactose. Lactose is dissolved in the liquid whey and constitutes almost 5% of milk’s total volume. Two sugars, called galactose and glucose, bond together to make lactose and give milk a touch of sweetness. The temperatures normally used to steam or froth milk do not affect lactose which allows its sweetness to carry over into the foam. If, however, you over-steam the milk a chemical reaction (often called the Maillard reaction) takes place between the lactose and protein molecules. This reaction causes the milk or foam to brown and taste burnt. These important components of milk and how they react to heat explain many of the mistakes that beginners make as they practice steaming and frothing milk. Once you have thick, smooth steamed milk and firm milk foam down to a science, you can use it in a wide variety of coffee beverages, including two types of cappuccinos. 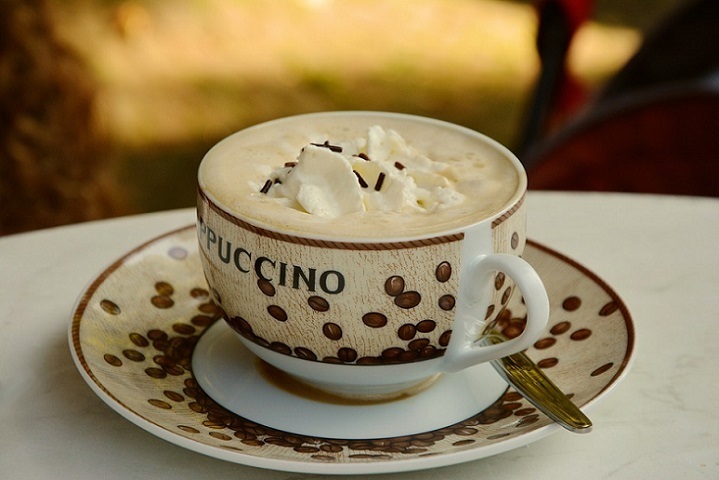 In the early 16th century, the Italians invented the cappuccino and named it in honor of the Capuchin monks. These monks, who wore light brown habits with pointed hoods hanging down their backs, were a familiar sight. They traveled from city to city across Italy and into neighboring countries doing all they could to aid the poor and spread knowledge and justice. In those early days, strong coffee and milk were mixed together to make a cappuccino. Today most cappuccinos include two shots of espresso. The strong, bitter coffee blends that go into espressos provide the perfect contrast to the smooth, sweet steamed milk and foam that float above it. Two shots of espresso equal two fluid ounces and to make a traditional cappuccino, the barista tops the espresso with the same amount of steamed milk followed by an equal amount of foam. A wet cappuccino includes more steamed milk and only a thin layer of foam. Remember that milk foam serves as a canvas for latte art and the thicker the layer of foam is the better. If you hope to showcase some artwork, you will want to make a traditional cappuccino or even a dry one. Dry cappuccinos are made by adding less steamed milk and lots of foam. Although we don’t usually notice it, a cappuccino’s foam does affect the enjoyment that we receive from it. Foam gives us a creamy sensation in our mouths, but more importantly the air bubbles in the foam pop releasing aromas which trigger our sense of smell and enhance our perception of flavor. Perhaps that explains why some folks enjoy “bone-dry” cappuccinos or those that have only milk foam and no steamed milk. Whether you enjoy your cappuccino with a lot of steamed milk or only a little, with a generous blanket of foam or just a thin layer, don’t forget to relax and savor its aroma first of all and then its perfect blend of flavors. Previous story What goes good with coffee?